Visit us at IP Counsel Cafe “Parts Unknown: Global IP in an Increasingly Connected Yet Foreign World” in Palo Alto, California on May 7 and 8, 2019. 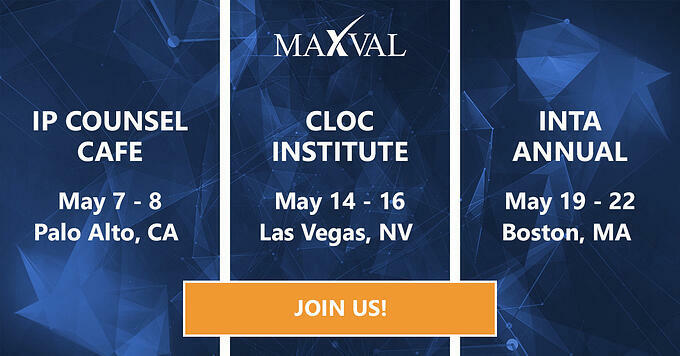 MaxVal is sponsoring the 11th annual event of IP Business Congress Global (IPBC), to be held from June 10-12, 2018 at Palace Hotel, San Francisco. MaxVal is exhibiting at INTA 140th Annual meeting at Booth #418, to be held from May 19-23 at Washington State Convention Center, Seattle, WA. 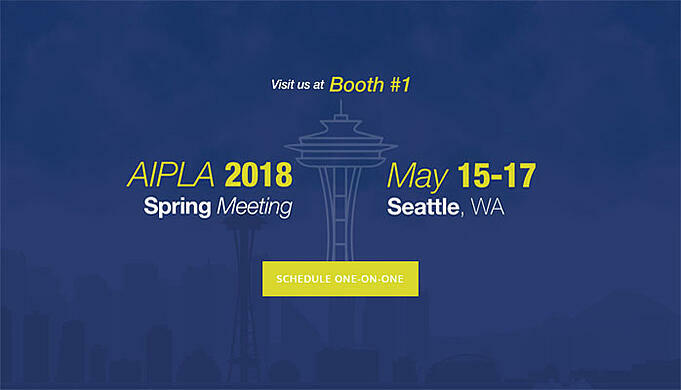 MaxVal will be exhibiting at the AIPLA 2018 Spring Meeting at Booth #1 , on May 15-17, 2018 (The Westin Seattle in Seattle, WA). 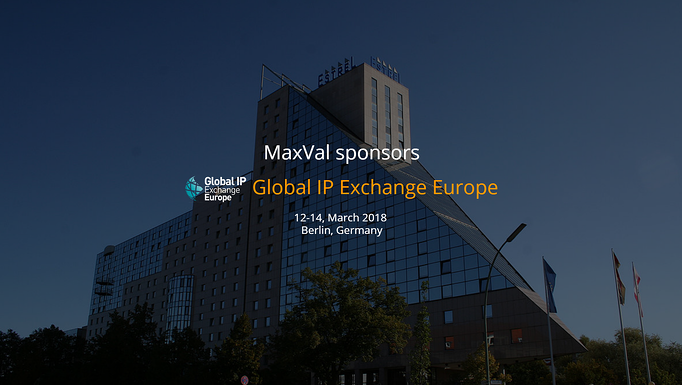 We are pleased to announce that MaxVal is sponsoring the 9th Global IP Exchange 2018 to be held in Berlin, Germany (March 12-14, 2018). 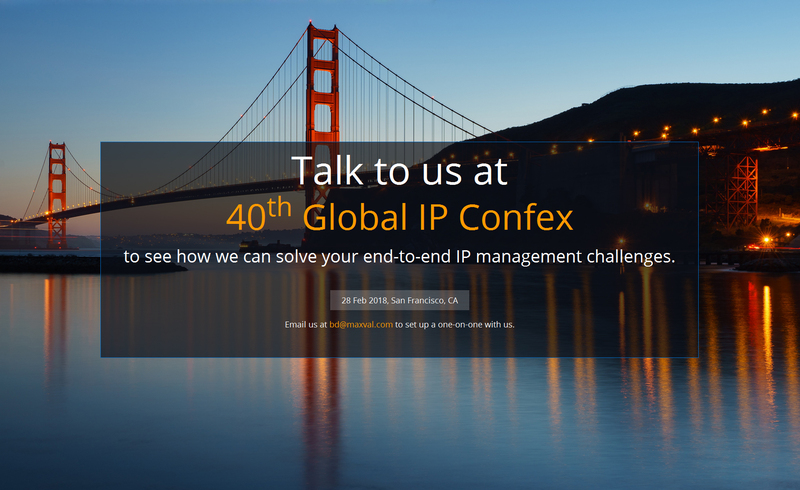 MaxVal is participating in the 40th Global IP Confex - 2018, an event where IP professionals meet services providers to discuss technologies and strategies to address their IP related challenges. The conference will be held at Executive Conference Center, Marriott Marquis Hotel (San Francisco, CA) on Feb 28, 2018. Global IP ConfEx brings together the In-house Counsel, Law Firm Partners, Law Tech Professionals, Tech Vendors and Selected Service Providers around the world to share their views and solutions to resolve some of the operational challenges in Litigation, Technology, Software, E-discovery, Risk, Security and Compliance. As an exhibitor, MaxVal will demonstrate its flagship product Symphony – an end-to-end intellectual asset management solution for companies which would enable IP Counsel to make strategic data-driven decisions.